Billy Koehler writes college football commentary and analysis. You can find him at ThirdDownDraw.com or on twitter @BillyKoehler. If you listened to the latest TRC Unleashed you heard them mention that we may know less about the 2015 South Carolina football team than any team in recent memory. Though true of the entire team this is especially true of the defense. Between new defensive coordinator Jon Hoke, closed practices and limited media availability, it’s tough to know exactly what the defense is going to look like, but here’s generally what to expect. South Carolina will run its defense out of a base 4-3 set. 4-3 describes the personnel grouping that is on the field when the defense is in its main set. There will be four defensive linemen and three linebackers. This is very similar to the 4-2-5 that USC has been running for the last few seasons. The difference is that rather than having two linebackers and a Spur defender (who was a hybrid linebacker-defensive back) this defense will have three pure linebackers. In passing situations and against some offenses, notably spread teams, South Carolina will go to a nickel defense. A nickel defense is named because it has five defensive backs. To get the fifth defensive back on the field, South Carolina will substitute out a linebacker, and the resulting defense will look a lot like the old 4-2-5. 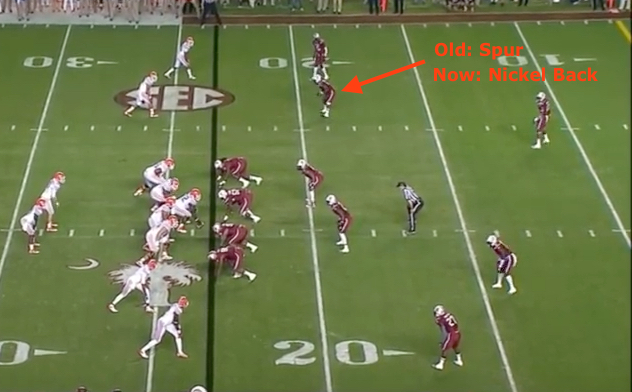 The change from the 4-2-5 to the 4-3 isn’t a drastic one, which is good for South Carolina. Whenever a new coordinator with a new philosophy comes in he often has to find players that fit his system. That will not really be the case with South Carolina and Jon Hoke. Because the 4-2-5 and 4-3 are so similar, the players that have been recruited fit the new system just as well as the old system. Reports out of fall camp have talked a lot about the 1 technique and the 3 technique. These labels describe positions on the interior of the defensive line, specifically the defensive tackles. Numbered techniques, like the 1 and the 3, describe the position a defensive tackle lines up in. A 1 technique lines up on the center’s outside shoulder. A 3 technique lines up on a guard’s outside shoulder. The 1 technique is a bigger defensive tackle who will be tasked with holding his ground and stopping the run, much like a nose guard. The 3 technique is usually a little more nimble, for a defensive tackle, and is more of a pass rushing threat. From a defensive perspective the spaces between the offensive linemen are called gaps. (On offense they’re called holes.) In different defensive schemes the defensive linemen are responsible for either one gap or two. Typically when a defensive lineman lines up directly across from an offensive lineman, the defender has responsibility for the gaps on either side of the lineman, two gap responsibility. Conversely, when a defender lines up on a lineman’s shoulder or in a gap, he usually has responsibility for just that gap. As you have probably guessed, South Carolina’s defensive lineman will have one gap responsibility. They will be able to simply charge up field penetrate into the backfield. If they penetrate through the gap, then they are controlling the gap. This is part of what Hoke is talking about when he says the defense will be more aggressive. It should result in more tackles for losses in the backfield and more disrupted plays. South Carolina will probably be predominantly a zone pass coverage team. They will be capable of playing man to man coverage, but Jon Hoke’s history suggests they will probably be in a zone most of the time. It has been rumored, and is quite possible South Carolina will end up running the renowned Tampa Two coverage. To understand the Tampa Two, which is a coverage, not an entire defense, it is helpful to have an understanding of the Cover Two from which it was modified. Cover Two, in its most basic form, means two players in zone coverage split the deepest part of the field into two zones, one covered by each. It is common with a cover two to have the cornerbacks and linebackers each cover zones in the shorter passing areas, as you can see above. The weakness with a cover two is the vast amount of real estate the safeties, who are usually the deep men in the coverage, have to cover. Typically receivers can get open in the middle of the field, deep and in the corners. The Tampa Two seeks to take this away. 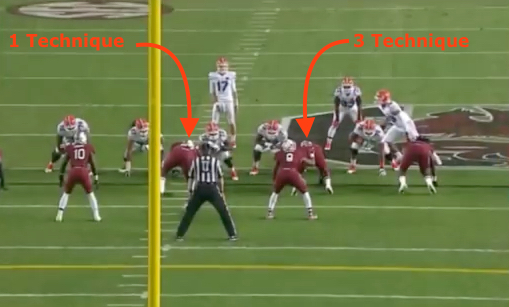 The main component of the Tampa Two is the middle linebacker dropping deep, very deep. When the defense reads pass they drop to their zones. The middle linebacker drops back almost as deep as the safeties, taking away the deep middle route. The other two linebackers squeeze in to cover the space left by the middle linebacker. The corners have the same responsibility. There are nuances to each position, but that’s basically it for the Tampa Two. With all of the zone play South Carolina’s defense should have more interceptions this season. All of the defense should be looking into the backfield and be able to break on the ball. Given Jon Hoke’s defensive pedigree, it is quite likely South Carolina will be running some zone blitzes. Technically a zone blitz is any blitz in which the defense is in zone coverage behind it, but most fans recognize a zone blitz when a defensive lineman drops into coverage. Look at the diagram above of the Tampa Two coverage. In a zone blitz one of those zone defenders, usually one of the three linebackers, will blitz and another player, usually a defensive lineman, will take his place. The best case scenario for the zone blitz is not a sack but an interception. The defense wants the quarterback to recognize the blitzing defender and instinctively try to throw the ball to the area where the defender has left. Instead of finding an open receiver there, he should find a defensive lineman waiting to catch the ball. Does a new coordinator with a modified scheme mean South Carolina’s defense will be better? Maybe, it would be hard to be worse. The Gamecocks will be employing a coherent defensive gameplan that has been successful before. If they aren’t effective or are beat, it will probably not be because of schematic deficiencies. Effectiveness will come down to coverage and tackling, but USC should be in position to be better at both. Yes they are. Good point. That is a bit redundant for the center. Ah, I thought maybe it was relative to strong-side/weak-side or something. Thanks! Thanks, the article is concise and helpful. I learned something new!